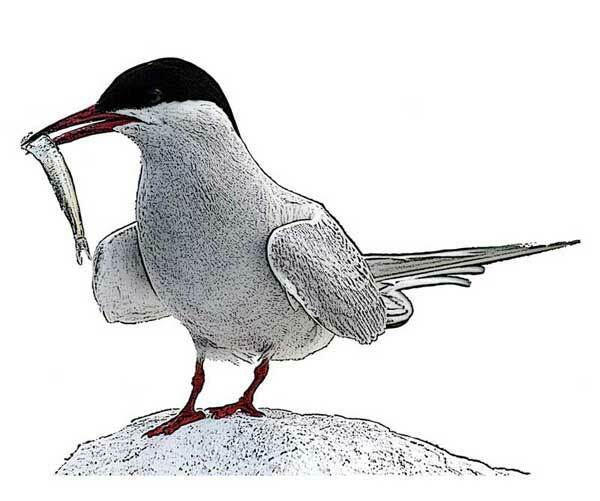 This medium-sized tern is white with light-grey upperparts, a black cap and a long, deeply forked tail. The undersides of its wings are white with dark tips. Arctic terns have the longest migration of all birds, breeding on Arctic tundra and wintering in Antarctica. We go to Col Sam Smith Park in south Etobicoke a few times each week. The Arctic tern often visits on its migration north in spring, or again in fall going south. It is a majestic and beautiful bird, with a haunting call. This summer one pair has decided to nest in our park. It is always a treat to see these birds - similar to their seagull cousins, but much more unique and independent. Their connection to the Arctic makes them all that much more inspiring. The selection of emblems must be justified with characteristics typifying the selectors. The artic tern uses all the coastlines framing Canada; they are understated - concealing their strength, their ingenuity and their longevity; they are comfortable on the whole of the globe but to ensure their continuity by always returning to our artic for breeding; they are connected to their breeding partner for decades; their design makes for beauty and functionality and finally they are fierce defenders of what is theirs but not desiring more than what they need. Sounds like an idealization of a Canadian to me! The arctic tern has the longest migration route. This is bold, this is Canada. Many years ago I was working with a University Professor in field Biology. We were looking at nesting habitats of shore birds. Since gulls are so adaptable and nest next to anywhere, we were looking at ways to increase nesting space for the Arctic tern. I really grew to appreciate these beautiful birds and realized that when many people look up at the shores and see the birds, they think that they are all gulls. It is time for the tern to be recognized! The Arctic Tern, even by its name, acknowledges our vast northern territories and our claim to arctic sovereignty. A very apt choice for our national bird. The Arctic Tern best explemplifies the tur natur of what it means to be Canadian. Adventurous, hardy, curious, intelligent. These avian "voyageurs" travel great distances, through many climates and environents, always to return to our spectacular northern climes where they not only survive but flourish. I can think of no better example of the Canadian spirit. I ask you to give your most serious consideration to the adoption of the Arctic Tern as Canada's national bird. Long-distance migration in the winter -- achieving the aspirations of Canadians from coast to coast. The Arctic Tern has the longest migratory flight of any bird on Earth, from the Arctic to the Antarctic and return, which is what I do myself, as I serve as ice-pilot for ships in both polar regions. While I fly by jet aircraft between polar regions, and the Arctic Tern has to use its wings, I can fully understand the enormous effort these birds make twice each year. They must be Canadians because it is in Canada that they breed, they fiercely defend their nests from much larger marauding raptors, people, polar bears and even helicopters. They are truly admirable birds deserving of national recognition for their characteristic endurance, courage and Canadian residency. They are beautiful birds, perfectly designed for speed and agility as well as long-distance commuting, embodying in one small package all the best of the Canadian character. 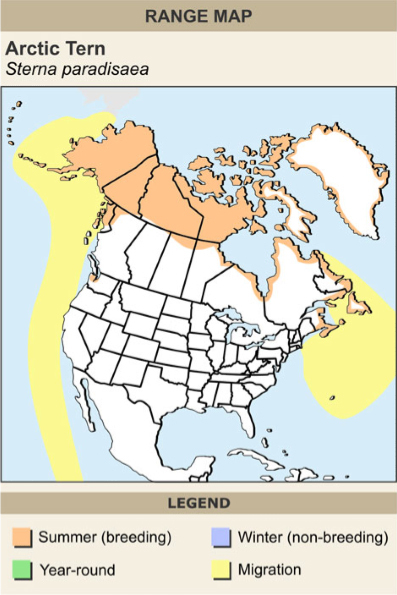 Like Canadians, the Arctic Tern has a range that includes the whole globe. Its amazing strength and endurance need to be acknowledged and celebrated, especially as the Arctic is melting and changing the world everywhere. Arctic terns are one of my favourite species of bird in general, and are almost exclusively found in the Canadian Arctic. I saw some while on a Students on Ice expedition and was touched by their beauty and skill. I voted for the artic tern because it is amazing flyer, it is very beautiful, and it is really fiesty. I watched a pair of nesting terns take on two bald eagles and send them running and shortly after they took on a bull elk that was getting too close to their nest. I would like to thing Canadians are like those terns, beautiful, skillful and really mean when riled!